E clips are a particular type of circlip and are in fact sometimes referred to as E type circlips. They may also be called E-rings. 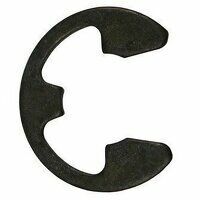 They get their name from their distinctive shape which allows the clip to grip the groove of the relevant component at three different points forming something like an E-shape when viewed from above. Here at Bearingboys, we have a wide selection of e-clips on offer in various different sizes and in pack sizes of 20 and 100. The standard material used is carbon spring steel and the standard finish is phosphate and oil. Our D1500 metric series range incorporates DIN 6799 and BS 3673/2.